This woman is 51. 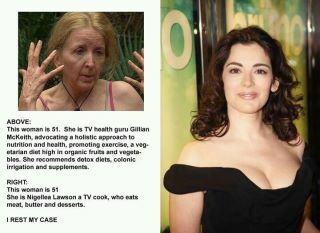 She is TV health guru Gillian McKeith, advocating a holistic approach to nutrition and health, promoting exercice, a vegetarian diet high in organic fruits and vegetable. She recommends detox diets, colonic irrigation and supplements. This woman is 51. She is Nigellea Lawson, a TV cook, who eats meat, butter and desserts. Now, I don’t even know where to begin about this piece of crap. Obviously this is just going to get anti-vegan and anti-veggie people to point out how unhealthy this diet is, and well, you know the drill. I responded to that friend, saying this is a very gross generalization, and it was actually a misrepresentation, which is very dangerous. And I could bet actual money Nigellea has had cosmetic surgery. Therefore, this little piece is not proving anything. After 4 weeks, the participants eating the plant-based diet, rich in nutrients and phytochemicals, reduced their total and LDL cholesterol significantly more than the participants consuming a standard low-fat diet.